15th Annual Northern California EMDRIA Regional Meeting (March 30, 2019) – SOLD OUT – Philip Manfield, Ph.D. Optional CA BBS CE credit is available for an additional $15 for the six hour session. See below for more information about CE credits. Last year this conference filled, and we were unable to accept registrations at the door; lunch will only be guaranteed for fully-paid registrations received on or before Saturday, March 22, 2018. We order a quantity of lunches based on paid registrations. Lunches for later registrants may be available if there are enough. 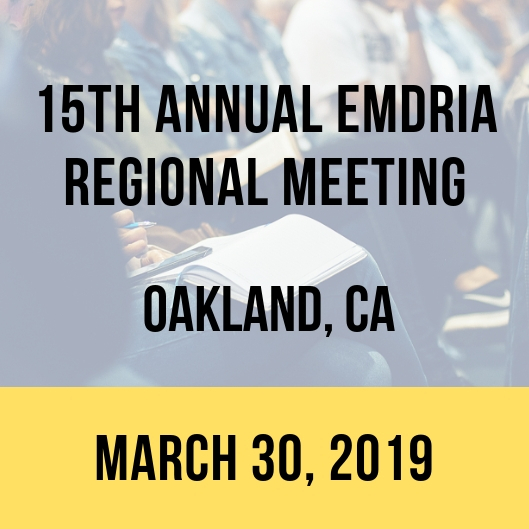 Eligibility: Registration for the 2019 Northern California EMDRIA Regional Meeting is open to all clinicians who have completed any part of an EMDRIA-approved basic EMDR training. Cancellation: Reservations may be cancelled for a full refund up until one week prior to the event; after that date, no refunds will be given. If you register and pay for the presentation and do not attend and do not cancel, your registration fee will be forfeited. If you register but your check is not received within a week of your registration, your registration may be voided and your place made available to someone else. CE Credits: This presentation is approved for 6 units of CA BBS CE credits and 6 EMDRIA credits. EMDRIA CE credits are only needed for those EMDRIA members who are “certified” (or are applying for certification) and those who are “approved consultants.” TO RECEIVE CE CREDIT’S PARTICIPANTS MUST COMPLETE THE ENTIRE DAY (SIX HOURS). There is no additional charge for EMDRIA credits; however, you will need let us know if you require EMDRIA credits when you register (via check or online). If you send a check for $70, we will assume that you wish to obtain CA BBS CE’s @ $15 for the 6 hours. This cost is up from the past 12 years due to a policy that the BBS has adopted making the process of getting approval for CE’s difficult and quite time consuming. Transportation/Directions: Preservation Park is in downtown Oakland at 13th Street and Martin Luther King Jr. Way. It is a few blocks south from the 12th street exit/entrance of US 980 freeway, which is also CA 24. You can reach Preservation Park by BART by taking the 12th St downtown station and walking about 5 blocks north on 12th Street. Parking: Parking arrangements will be the same as last year. You can park in the garage directly across the street from the main gate of Preservation Park, and there will be NO CHARGE. We have paid the city to keep this garage open for us on Saturday. The parking garage entrance is directly across the street from Preservation Park at the corner of Martin Luther King, Jr. Way and 12th Street. Park in any open spot (there are 200) including those that say “PERMIT ONLY.” Exit the Martin Luther King Jr. Way side of the lot, and cross diagonally to Preservation Park. PLEASE NOTE: All vehicles MUST be removed from the garage by 6pm or they will not be retrievable until Monday morning! Presentation Description: Dysregulated, dissociative, attachment-wounded clients can be especially challenging to work with. They’re often overwhelmed by painful emotions that are difficult to manage. They often feel like wounding from the past is happening right now. Stabilizing these clients well is essential for safe and effective EMDR. This workshop will introduce a collection of unique ego state therapy interventions from the Developmental Needs Meeting Strategy (DNMS), for stabilizing these clients. In the background section Shirley Jean will discuss the differences between attachment wounds and trauma wounds, and why that matters. She’ll offer a brief primer on parts of self and how they get triggered. She’ll discuss how we can predict EMDR when we know the intensity of client attachment wounds and degree of accessible adaptive information. Next, she’ll describe a simple protocol for mobilizing a team of vetted Resources, and for establishing a Special Safe Place for wounded parts to hang out. Then she’ll describe ways to talk directly to triggered wounded child parts (1) to welcome them; (2) to, attune, validate, and empathize with them; (3) to get them bonding with a Resource Team who can meet their emotional needs; (4) to orient them to present time; and (5) to reassure them that their perception of “reliving” an old trauma is just a harmless recording playing back. When these interventions are provided together, in the right order, they have a profound stabilizing effect—enough to neutralize the child part’s trigger. And when repeated over time, with more and more child parts, the client begins to feel more stable. Eventually clients will report triggering episodes happen less often, have less peak intensity, and resolve more quickly. Once a client is sufficiently stable, EMDR processing becomes an option. The workshop will include a few brief practice exercises and a video of a real therapy session. Presenter Bio: Shirley Jean Schmidt, MA, LPC, is a Licensed Professional Counselor near Portland, Oregon. She was trained in EMDR in 1995. She’s a former EMDRIA-Approved Consultant. She began integrating EMDR with ego state therapy in the late 90s – inspiring her to develop a complimentary therapy approach, the Developmental Needs Meeting Strategy (DNMS). She’s trained hundreds of therapists in the DNMS over the last 20 years. She recently expanded her model to include these powerful stabilizing interventions. She has published many professional articles in the EMDRIA Newsletter and given several presentations at EMDRIA conferences about integrating EMDR with ego state therapy. She holds the patent on the TheraTapper, an EMDR tapping device. Describe how to guide clients to mobilize a team of vetted Resources. Describe how to guide clients to establish a Special Safe Place where wounded parts can rest and play. Describe how to directly dialogue with a wounded child part, to attune, validate, and empathize. Describe how to orient a wounded child part to present time. Describe how to reassure a wounded child part that her perception of “reliving” an old trauma is just a harmless recording playing back. Other Questions: If you have additional questions please contact the administrator at info@philipmanfield.com.